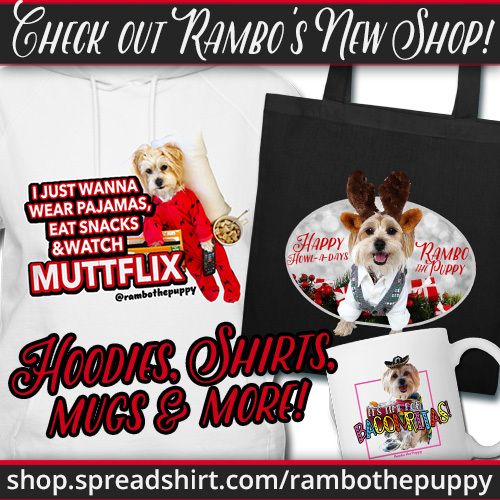 Rambo the Puppy Products Are Finally Here!!! i’ve got some BIG NEWS, fur-iends! ok, are you sitting down? you might want to sit down for this. 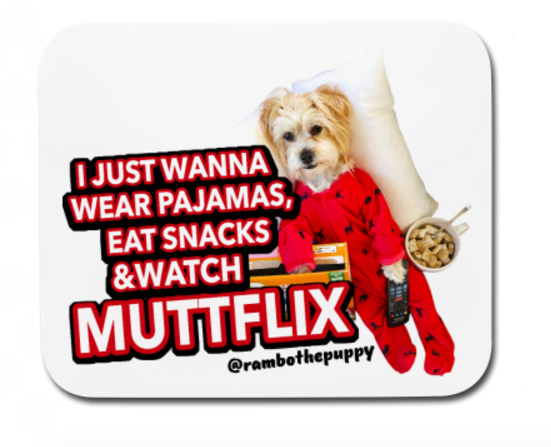 i just launched my very own website with rambo the puppy products! yes. really! you can now buy a shirt, coffee mug, mouse pad, phone case (and lots more stuff!) WITH MY FACE ON IT. if that isn’t the coolest thing in the world, i don’t know what is. 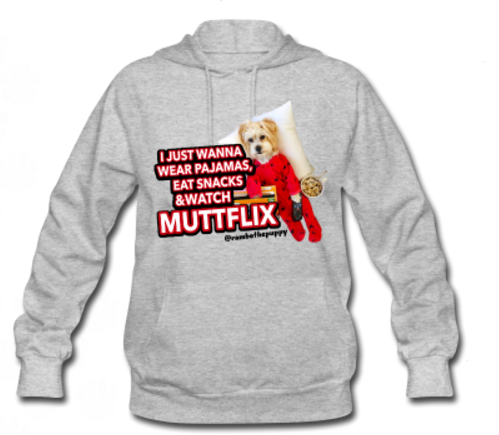 i worked with a company called spreadshirt to create the designs, products and website, all of which you can see now by visiting my very own online product store! 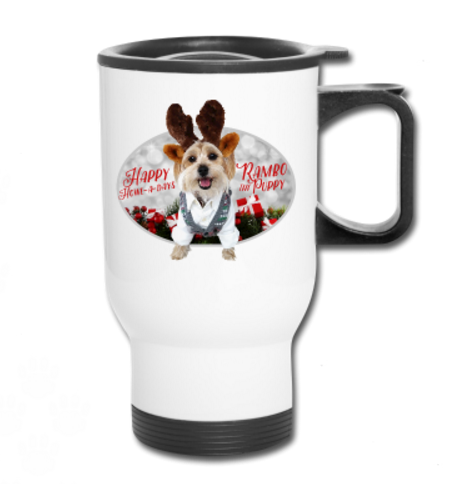 my fans have been whining – ok, maybe not whining, more like, asking a lot about when the PUP they were going to be able to buy stuff with my cute lil’ furry face on it. well, whine – i mean – ask no more! the day has finally come. *yay! * i can’t wait to hear what you think about all the products in my new online store! pssst! 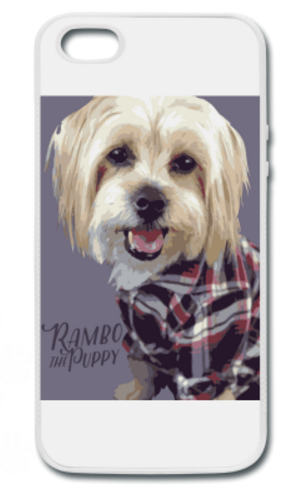 until december 13th, my fans can get 15% off their entire order of paw-some rambo the puppy products with code RAMBO15! there’s nothing cuter than a reindog, right? 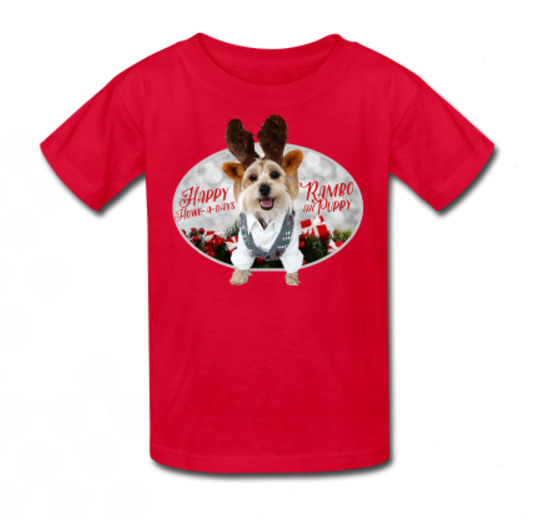 and since it’s the howl-a-days, i decided to create a bunch of howl-a-day themed products that feature me in my favorite antlers (and super cute sweater vest!). 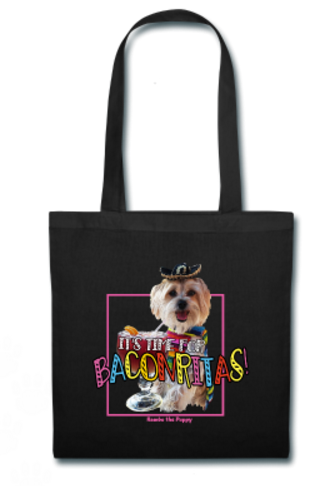 Fiesta Rams: It’s Time for Baconritas! 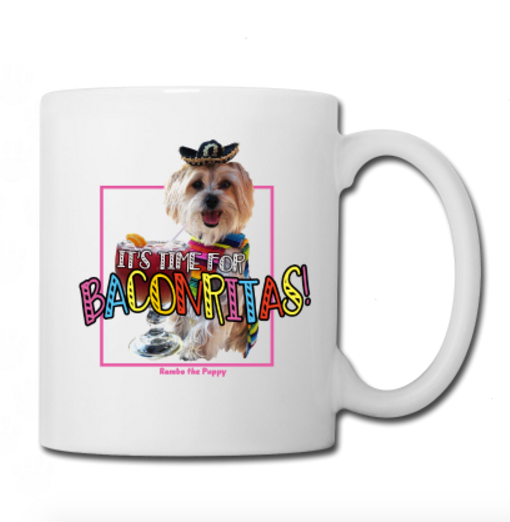 of course i had to make some products that featured me doing my favorite thing: drinking baconritas! 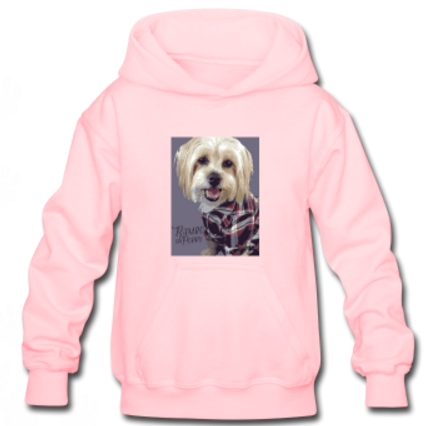 and last but not least, i chose a design that showed me at my very best – up close and paw-sonal, of course! 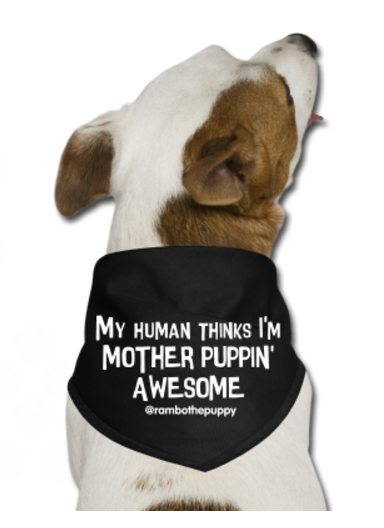 NEW: mother puppin’ paw-some dog bandanas! 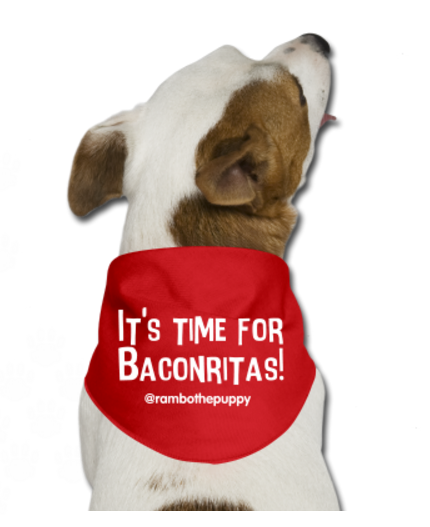 after reading all your comments about what else you’d like to see in my online store, i got busy creating some new bandanas featuring my favorite mother puppin’ saying! 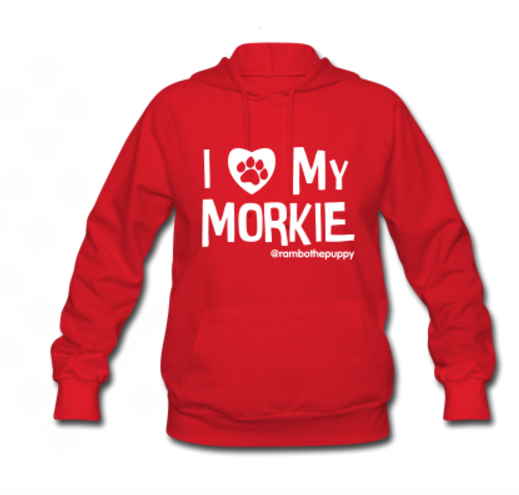 new: i love my morkie products! 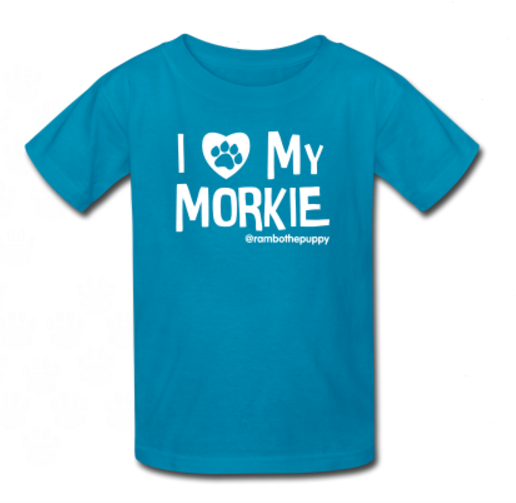 so many of my fans have morkies, so i thought it would be pretty paw-some to create some products with an “i love my morkie” design! Will it arrive before christmas? make sure to pace your order no later than december 13th (US domestic standard shipping) if you want it to arrive before christmas! PawSpa PetJet: My New Doggie Bath Time Secret! Enter the #FreshpetMadeMe Freshpet Contest! Congratulations Rams, couldn’t be happier! Love you and all your products. Best of luck!! Hugs and Kisses. This is wonderful beautiful Rambo!!! Will certainly order. Love you sweet Rambo!!!! Finally ! Good luck ! Love it all Rams ! I wondered when you were going to do this, and now it’s here. Yeah!!!! yeahhh!!! yahoo!!! i’m so excited it’s here! hope you like the product designs i came up with!!! such wonderful things! well, I got a mouse pad but my Elmo got nothing, boo hoo, I would have bought him a toy or something to play with, but there wasn’t anything… maybe later you expand in that direction? What if you asked StainMaster to put Rambo pictures on their carpet remnants, I mean cut them up to look like little mats and they could be used to put food and water bowls on them or make a “bridge” between 2 rooms or put in front of the fire place or frame it and hang on the wall, different sizes, different pictures, etc? they make cloth for dresses that way, right? I saw that on the designer shows/competition, so why not use carpet remnants? can you tell I am so excited about your new venture, hahaha!